Putin’s Monday statement that he has ordered majority of Russia’s assets in Syria back home came as a huge surprise to most everyone including myself and has typically been described as a « shock announcement ». In my mind there is little doubt that Putin cherished the shock the announcement caused and certainly staged it in such a way to maximize that effect. That said can we really let ourselves get off that easy? After all if memory serves the Russians when they announced the (equally surprising) military intervention in Syria clearly and unambiguously said it would only be of a very limited duration. « There is always a risk of being bogged down but in Moscow, we are talking about an operation of three to four months, » Alexei Pushkov, an ally of Russian President Vladimir Putin, told French radio station Europe 1. He added that the strikes were going to intensify. “My words were taken out of context as I wanted to say that the American military operation in Syria has been going on for more than a year. In regard to the Russian military operation, I meant that it would be limited in time and would have a fully defined timeframe. Going in the Russians did not have a hard time limit, but it was clear they were thinking in terms of months rather than years. 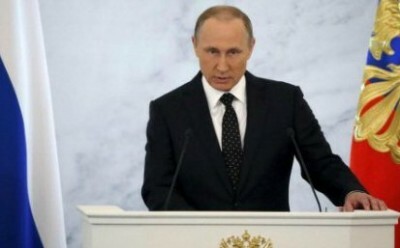 The aim of the Russian military operation in Syria – is the stabilization of the legitimate authority in the country, said Russian President Vladimir Putin. « Our task is to stabilize the legitimate authority and create conditions for a political compromise », – he said in an interview with the program « Sunday Night with Vladimir Solovyov » on TV channel « Russia-1 ». Since the Damascus government is now no longer losing ground but expanding instead, and there are peace talks that have already produced a partial ceasefire that has held better and longer than anyone expected at its inception the criteria for Russian withdrawal was met. So why was Monday such a surprise? Because most everyone had refused to take seriously Kremlin’s words that this is a strictly time-limited as well as a goals-limited operation. These included both those who hoped Russia would become stuck in a quagmire, and those who hoped Moscow would do more to help Syrians defeat the Saudi/Turkish/CIA-backed jihad in their country. The lesson: If Russians say they’ll do something – they might. De l’agent orange étasunien au Roundup européen : Le Vietnam poursuit sa lutte! Un beau pavé dans le miroir des médias!